Taxonomies are the means by which users interact with information systems. They support multiple functions such as capture, aggregation, arrangement, navigation, searching and analytics. Taxonomies come in many different shapes and sizes. In the broadest sense, a taxonomy is an arrangement of metadata, typically concepts or terms. The term taxonomy is used widely across a range of contexts and definitions will vary depending on which discipline you follow. The design of your taxonomy will depend on the information system you work with and the means by which terms are captured into the system. Your taxonomy could be as simple as a list, a simple hierarchy or a more complex network of terms. 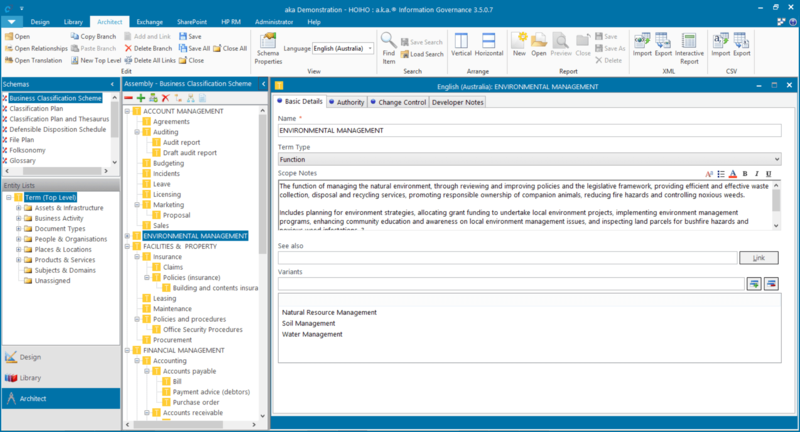 Authority Lists, Term Lists, Hierarchies, File Plans, Business Classification Schemes, Thesauri and Ontologies – all of these taxonomies can be built and managed within a.k.a.®. a.k.a.® is capable of creating and managing multiple types of taxonomy relationships. Relationships in a.k.a.® are fully configurable and can be of any kind that can be defined by the user including the full suite of relationships as defined in standards such as ISO15964. a.k.a.® can be installed with a wide range of taxonomy templates. We have designs for simple lists, hierarchies, poly-hierarchies, folksonomies, thesauri and ontologies. The a.k.a.® design templates provide you with a starting point from which you can add or subtract to customise and deploy your own data design. a.k.a.® import and editing tools are designed to enable you to work at speed. Our import functions enable fast data capture from spreadsheets. Usability features like type-ahead and bulk save make editing a breeze, and relationships can be built by using drag and drop functionality. Through API’s and web services, taxonomies in a.k.a.® can be loaded directly into SharePoint Term Store (Managed Metadata) and into HP Content Manager (formerly TRIM).